Our Little Miracles: Ba! Ba! Ba! The boys LOVE bathtime! 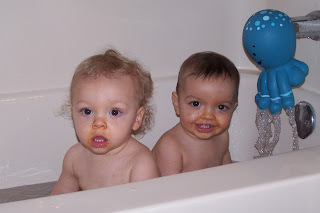 I usually give them something messy for supper (like spaghetti), and afterwards I ask, "do you want a bath?" They look at me and start going "ba! ba! ba!" and try to get out of their chairs. I will take them out and tell them to go take a bath and they head straight for the bathroom door and beat on it until I get there. In the mean time, they are pulling at their clothes trying to get them off. 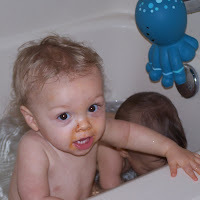 When they are in the tub, they love to play with the water as it is coming out. When that is over, they play with their toys, or experiment with putting their faces in the water. It all ends with them dancing and me asking if they want out and them shaking their heads no. It is so funny to watch. Here are some more Ba! pictures. You can see Carson trying to drink the water in the first picture. 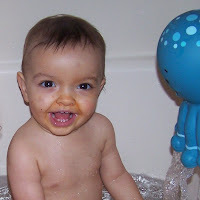 Aaron is a big bath fan, too! He tries to climb into the tub while the water is still running - its so cute to see him trying to lift his little leg up over the side of the tub.